Why is the debate important? Because of the infamous chart you see below (courtesy of hedge fund QB Partners and the St. Louis Fed) and all the investing implications that stem from it. Chances are high you’ve seen that chart before. It’s been referenced countless times (including more than once in these pages). It’s been cited so many times, in fact, that your editor is admittedly getting a bit tired of it. Some investors say the Fed’s unprecedented expansion of the monetary base — that vertical rocket shot pictured in the chart — acts as proof in itself that inflation is here. These investors directly define inflation as a change in the money supply. They make a straight connection between pumping more dollars into the system (expanding the money supply) and inflation’s immediate presence. With all due respect to the late great Milton Friedman, your humble editor rejects this notion. Inflation is NOT the same thing as a change in the money supply. 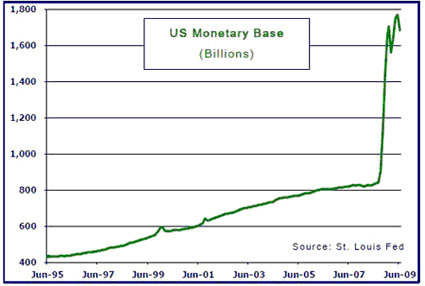 A dramatic expansion of the U.S. monetary base does NOT automatically count as inflation. It does NOT automatically mean that inflation is here. To begin, one should remember that monetary policy acts with a lag. When the Federal Reserve changes something, you don’t always see the result right away… and the result isn’t always the desired one. Think of a very old water heater in a very old house. When you turn the faucet to “hot,” you won’t get hot water right away. It might take 30 seconds, or it might take three minutes. If the heater and the pipes are in a poor enough state of repair, you might not get any hot water at all. In November of 2008, we ran a piece titled “The Importance of Monetary Velocity.” If you want to get your head around why velocity is so important, it’s worth a read. To quickly recap here, inflation and deflation are not purely functions of how much money is the system. They are functions of how fast that money is moving through the system. When banks are lending, businesses are borrowing, and consumers are spending, money changes hands quickly. It zips around like molecules in a heated gas chamber. Under these conditions, we can say that monetary velocity is high. Conversely, when banks are turtled up, businesses are hunkered down, and consumers are saving or paying down debt, money does not change hands quickly. It moves slowly and lethargically, like sluggish molecules in a cooled gas chamber. If the economy grinds to a near halt – as it did in late 2008 – money stops changing hands completely, like gas particles cooled to a liquid state (and puddled on the floor). So here is the thing. You don’t get inflation purely from an increase in the money supply. You also need sufficient monetary velocity to spur “a general and persistent increase in the price of goods and services.” If you don’t get that velocity –- if the money doesn’t move through the system –- there is no reason for prices to rise. Here is another slightly weird example to illustrate the point. Say, for some oddball reason, that the Federal Reserve decided to create a trillion dollars out of thin air and give it to Bill Gates. (No special reason it’s Bill Gates, just picking a name here.) Let us further say, for the sake of example, that Bill Gates has agreed to keep this trillion-dollar windfall in a non-interest bearing checking account, i.e. to just let it sit there. This would be a de facto expansion of the money supply, yes? A trillion new dollars now exist that didn’t exist before. But these dollars aren’t circulating through the system in any way, so how can they have an impact? The point is, it’s not just about how many dollars are being printed. It’s about where those dollars go and how fast they are moving through the system. Something else to consider: When it comes to changes in the money supply, debt acts like a sponge. That is to say, if excess monetary reserves are like water threatening to “flood” the system, then large quantities of debt are like giant sponges soaking up that water. Or if money is like matter, debt is like anti-matter. It is negative money… money already spent. Take the average U.S. consumer for example. When all the different forms of debt are added up – mortgage debt, credit card debt, vehicle financing and so on – the typical consumer is very deep in debt right now. By some estimates, the amount of “leverage” (i.e. total debt) on the U.S. consumer’s back, relative to his or her income, is still at all-time highs. Ah, but what about the banks? Even if a consumer just chunks money into a bank account, the bank will lend that money out again, right? Won’t the increased deposit balances at the banks thus have a stimulative effect, causing prices to rise, as the money gets put back into circulation? The above two charts from Gluskin Sheff date back 40 years or so. The upper chart shows how commercial bank cash assets rocketed higher in 2008 and 2009. 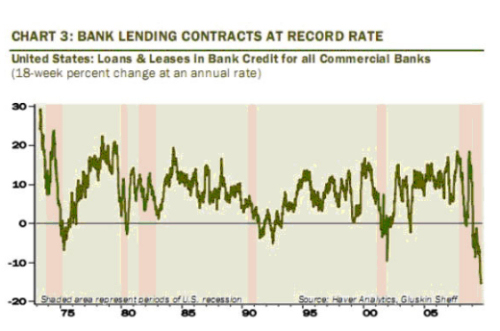 The lower chart shows how lending has contracted dramatically. This is “hoarding” activity in the extreme. Cash goes in to the banks, but doesn’t come out. Again, remember monetary velocity. How can all that Fed-supplied cash be pushing up prices if it isn’t moving through the system? Of course, if one believes the banks will eventually start lending out that dough willy-nilly, then one can argue that upward price pressures throughout the economy will eventually result. But eventually ain’t the same as here and now, is it? If this is the argument –- that a rush of new bank lending will set off the inflationary fireworks show –- then it is also a tacit admission that inflation is not purely a function of printed dollars… it is a function of those dollars changing hands (moving through the system). The same caveat applies to the belief that foreign central banks will ultimately dump their dollars. For dollars to be dumped on the open market means they change hands. So you see, it’s not just an increase in the money supply. That is only a precursor to a likely later outcome (that shows up with a lag). It’s where the money goes and how fast it gets there that matters. Getting back to the banks… some believe it’s only a matter of time before the banks start lending like gangbusters. As soon as the economy shows real signs of stabilizing, that cash is going to come out of the woodwork in the form of new loans, these folks argue. Then we’ll truly see things get hot and prices go nuts. Banks are making a killing on Treasuries. Thanks to the Fed keeping short-term rates at zero, the banks can borrow at next to no cost, make a leveraged bet on U.S. Treasuries, and earn 15% or 20% on their capital with very little risk (4.5% on long bonds, leveraged a modest 4X or 5X). Banks still have gigantic hidden real estate losses on their books! That last one is the real killer. Few people realize that the situation in residential and commercial real estate (CRE) remains very, very dire… and that banks still have epic hidden losses tucked away in their balance sheets. The financial system game plan of “extend and pretend” has not yet come to its horrible and gruesome conclusion. In short, the U.S. housing market is being propped up by the U.S. government. This support is proving so expensive, though, that it can’t last forever. Even Uncle Sam’s pockets are finite. This means that, when the government withdraws its housing support, we will have one of Warren Buffett’s “tide going out” situations. The artificially inflated value of trillions of dollars in residential and commercial real estate assets will fall… legions of tenants, hanging on by the skin of their teeth, will finally go under or be forced out… and the discrepancy between artificial accounting value and true resale value (in some cases “zero”) will be exposed. We will then see to what degree the banks have been swimming naked. 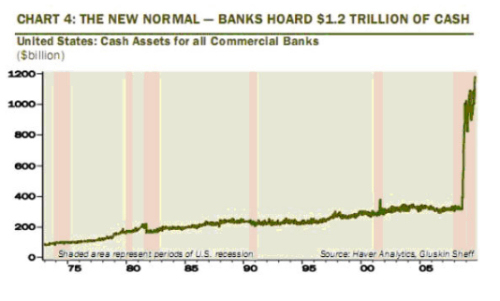 And the banks are hoarding cash in part to guard against that fateful day. This is a big reason, your humble editor believes, why the anticipated bank-lending explosion won’t happen. Much of that excess cash is already committed – to a looming tsunami of losses not yet realized, born of previous excesses not yet worked through. The goal here is not to complicate things, but to make sure the essential elements are addressed. If you understand that inflation is not an automatic result of an increase in the money supply, but a lagged event depending on how quickly money changes hands, you can then further understand why it sometimes takes a long time for inflation to show up in the system… and you can also see how large amounts of standing debt soak up money like a sponge, retarding both monetary velocity (the critical inflation variable) and prospects for economic growth. This understanding helps cultivate useful traits like patience on the investing side and creative flexibility on the trading side. If the dollar goes up (and gold down) for a bit longer than one might expect – or, even more perplexingly, if the financial press starts talking about falling prices and wages this year, even as the Fed keeps pumping – now you’ll (hopefully) have a better sense of why. The end game may indeed be accelerating monetary velocity, a knock-on rise in prices, and a spectacular loss of faith as the desire for dollars plummets… but there could be a ways to go before this happens.